Some gifts require such commitment that they may appear, at first (and second, and third) glance, to be burdensome. Especially if the enjoyment of said gift depends upon one's access to special equipment. Despite its beauty, upon first encountering this honey-laden comb, I responded as though we had just been gifted the collected works of Thomas Aquinas. With forebodings of the devotion the extraction would require, we left the comb to sit near the sink for months. 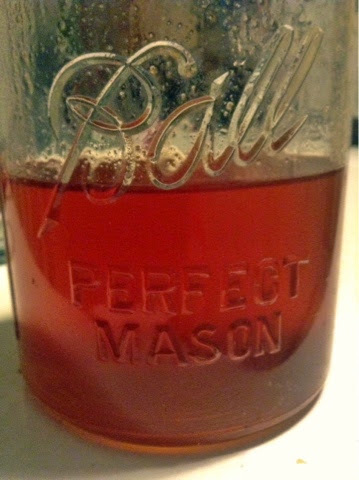 Now that the job is done, it's just a bit of a stretch to say that coaxing the scant quart of honey from that frame with the available tools involved an almost supernatural effort. One may have sooner drawn such bee-made sustenance from the rock of old. Easy enough, I suppose, when Yaweh's got your back. Instead, we had Blind Mamie and A.C. Forehand cued up to help us along. Actually, things might have gone smoothly if it had been hot outside. It was a warm day, but only in the 70s. 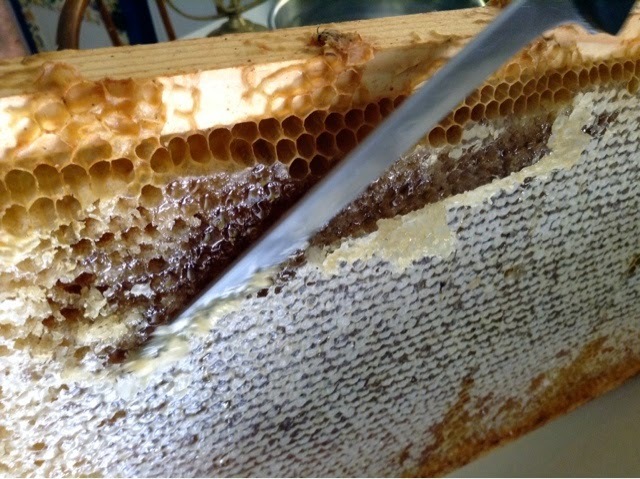 It needs to be in the 80s or 90s to get the honey to flow. 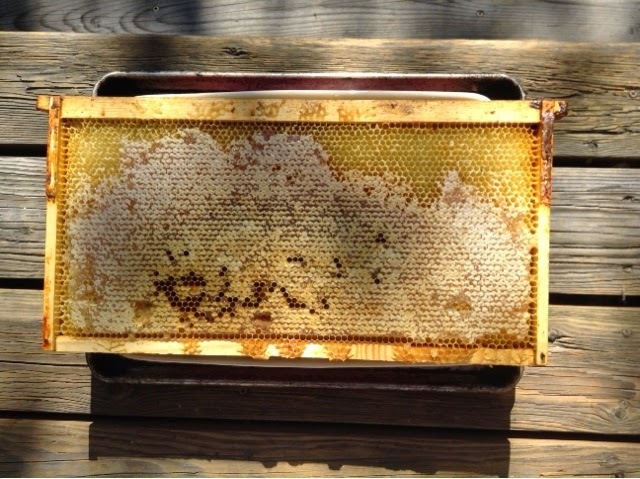 After cutting the comb, we inverted the frame and left it on the porch in the sun. 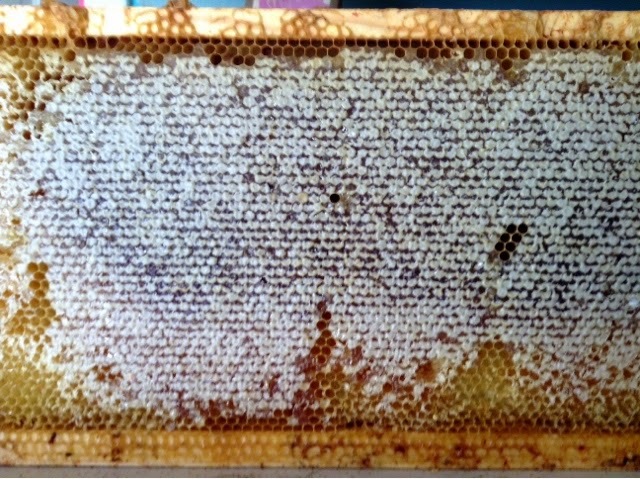 After an hour, there was a tablespoon of honey in the pan and it was obvious that the comb needed a little convincing. So I made the biggest mistake of the day and turned the oven on to bake at the lowest setting and popped in the frame. You can guess what happened: wax and honey liquefied and pooled together in the pan. Separating the two substances proved a challenge, but even more of a pain was getting the cooled, hardened beeswax off the pans and sieves and scrapers and sink and the oven itself. Therein was the real work. The wax will never come out of some of our equipment. Now, when roasting potatoes or Brussels sprouts, the oven gives off a faint scent of beeswax, which is kind of nice, I guess. All this, and for what? It's good and all, but I won't undertake such a project again without the proper equipment and the right temps. Still, it's nice to have friends who leave such things in your home while you are away.